Successfully Added Digital Voice Recorder Pen - 16GB Internal Memory, 3.5mm Audio Jack, Stylish Design, Easy To Carry, USB Flash MP3 Player, 180mAh to your Shopping Cart. This unique digital voice recorder lets you record your upcoming meetings and interviews in style. Although this gadget might look like just any other pen, it actually features a built-in microphone and 16GB of storage. Thanks to this, it is capable of recording sounds just as any other digital voice recorder would. With its portable design, this gizmo can be carried around effortlessly anywhere you go. 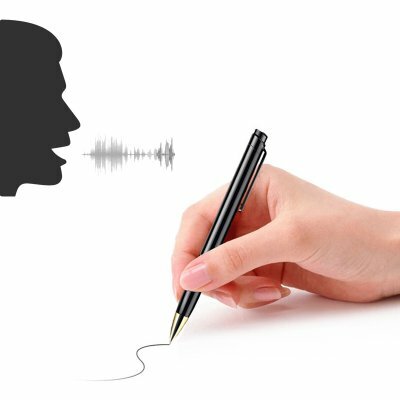 Whether you are a business person that wishes to record an interview or a student that wants to record a lecture – this voice recorder pen is sure to meet your demands. With its 180mAh battery, this gadget lets you record for up to 12 hours straight. It features a 3.5mm head phone jack so that you can instantly listen back previously recorded audio materials. Naturally, this voice recorder in the shape of a pen can also be used for writing just like any other pen. Therefore, nobody will be able to see that this pen actually packs a built-in voice recorder. From now on, you’ll never have to carry around bulky and ugly recording devices to your meetings again. With this stylish pen at your side, not a single important conversation stays unrecorded. This digital voice recorder pen comes with a 12 months warranty, brought to you by the leader in electronic devices as well as wholesale electronic gadgets..